Machinery installed on Repulse remained unchanged throughout her service life. The huge boiler room (over 58 m long) housed as many as 42 Babcock-Wilcox boilers distributed among six compartments. There were 3 boilers in compartment A, seven in compartment B and eight in each of the stern compartments (C, D, E and F). The boilers generated steam for four Brown-Curtis turbine units located in two engine room compartments. The turbines drove four-bladed propellers via main drive shafts. The ship’s machinery developed 112 000 SHP (112 400 after modifications) which translated into a top speed of almost 32 knots. Following various refits which significantly altered the hull’s hydrodynamic characteristics and increased the ship’s weight (addition of armor plating and installation of anti-torpedo bulges) the battlecruier’s top speed dropped to a little over 28 knots. Repulse featured a set of auxiliary generators delivering a total of 750 kW. Two of the generators were piston-powered (200 kW each), one was a turbine powered set (200 kW) and one was a hydraulic unit (150 kW). In total the machinery weighed in at 5 100 t. The ship carried 720 t of boiler water and 150 t of potable water. In keeping with an adage: “speed is armor” Renown class battlecruisers featured limited armored protection which was to be offset by a powerful propulsion system. The Battle of Jutland proved beyond any doubt that the concept was fundamentally flawed (the British lost three battlecruisers in the engagement). Later attempts to provide the ships with improved armored protection were, unfortunately, not entirely successful. When Repulse first entered service her citadel featured very thin 6” side armored protection, which was also very narrow (only 2.74 m with the lower section extending just one and a half feet below the waterline). The armor belt was only 4” thick in the area around turret A and 3” thick around turret Y. 2” armored strakes were located directly behind the main armor belt. Upper sections of the hull’s sides were protected by 1.5” armor plating. The front of the citadel was protected by a 4” bulkhead set at an angle (upper and lower edges were closer to the stern of the ship, while the mid section extended towards the bow). The stern bulkhead was 3” thick. Horizontal protection was based on two decks: lower deck (beginning at the lower edge of the main side armor belt – 2.5” thick and increasing to 3.5” above the steering gear compartment) and main deck (upper edge of the main armor belt, 0.75” to 3” thick). Upper and forecastle decks featured lighter protection (up to 1.25”). The main battery turrets and barbettes were better protected (but only just! ): the turrets were covered by 7” to 11” plates (4.25” on their roofs), while the barbettes had 7” armored protection in the upper sections and 4” plating around the lower sections. Sides of the conning tower were protected by 10” armor, while the roof and floor featured 6” and 3” protection, respectively. Armor protection particulars can be found in the tables. Below the waterline the ship’s hull was protected by anti-torpedo bulges, which additionally provided storage for fuel oil. Directly behind the anti-torpedo bulge, in the amidships section, was a narrow air-filled compartment enclosed by two thin, longitudinal bulkheads. The design weight of the entire protective armor was 4 770 t.
Repulse’s armor was modified and upgraded on several occasions during her 25 years of service. Some of the most significant modifications included increasing the main armor belt thickness to 9”, increasing the side armor plating between the main and upper decks to 6”, addition of 2” plates to the armor strakes above the ammunition magazines and 1” plates to the main deck, as well as the installation of much beefier anti-torpedo bulges, which covered the main armor belt. From 1936 Repulse featured strengthened lower deck protection (up to 3.5”) and additional plating on the main deck (up to 5.75”). The Renown class ships carried 15”/42 (381 mm) main guns mounted in twin Mk I* turrets. The gun was a very long-lived design and it was carried by as many as 22 Royal Navy vessels. The weapon was designed by Vickers-Armstrong back in 1912 and the first examples entered service in 1915. In total 186 guns of that type were manufactured between 1912 and 1915 along with 58 turrets. The main gun battery on HMS Repulse was mounted in two fore turrets (A and B) arranged in a superfiring position. Turret Y was located aft of the aft superstructure. Mk I* turrets were upgraded versions of the Mk I design and featured improved projectile and powder charge feed mechanism. Externally the Mk I* turret differed from the Mk I in that the former had a rounded front armor plate, while the latter featured a multi-angular plate. By the 1930s the 15”/42 gun was an outdated design, so the British decided to update the existing examples rather then embark on a costly gun replacement program. Under the upgrade program the gun’s poor effective range was to be raised by increasing the maximum elevation angle from 20 to 30 degrees and the use of new, more streamlined projectiles. The changes were introduced on HMS Renown during the ship’s modernization in 1936 – 1939. Her sister ship, however, would never undergo the weapons modernization program (partially, perhaps, because she was sunk in the early stages of the war). When she first entered service Repulse’s medium battery consisted of 17 relatively light caliber 4” guns (BL Mk IX). The weapons were installed in five tripple Mk I shielded mounts (two on each side of the forward stack, three on the aft superstructure along the ship’s centerline) and in two single mounts (each side of turret B on the shelter deck). The guns proved to be a big dissapointment. Training and elevating the weapons was a highly laborious exercise, not to mention that each triple set required a large crew (28 – 32 men). Not surprisingly the guns were gradually phased out from use aboard the ship: during the 1918 – 1921 refit the single-mounted cannons were removed, followed by triple installations that disappeared from in front of the mainmast during the 1933 – 1936 modernization and another triple mount that was removed in 1940. In 1941 only nine guns of that type still remained on Repulse’s deck. 1924 saw the installation of much improved and more modern 4” guns – 4”/45 QF Mk V single-mounted on unshielded Mk III mounts. Two such installations were placed on each side of the aft stack, while two more were added to the forecastle deck in the fore stack area. At the same time two sets of very similar 4”/45 (102 cm) QF Mk XV guns twin-mounted on Mk XVIII mounts were installed on the aft superstructure, each side of the mainmast. Mk XVIII mounts were experimental BD (between decks) type units. The guns’ rate of fire proved to be inadequate and during the 1939 refit they were replaced with 4”/45 QF Mk V models, which increased the total number of these weapons to six. From the beginning of her service life HMS Repulse’s AA capability was very poor indeed. In 1916 the ship’s AA protection consisted of five Maxim machine guns and only two 3”/45 (76.2 mm) 20cwt QF HA Mk I guns on unprotected Mk II mounts (placed on each side of the smoke stack). The guns were the first weapons purpose built as naval AA pieces, but they were also widely used by ground units during World War I. By 1922 two more guns of that type were added (they replaced obsolete 4”/42 BL Mk IX weapons). Two years later all 3” guns were removed and replaced by the 4” units. From 1936 the ship carried two eight-gun stations equipped with 2- pdr (40 mm/39) Mk VII guns, better known as pom-poms due to the characteristic sound they made while firing. The guns were mounted on each side of the fore stack, just aft of the triple 4” gun mounts. In 1940 Repulse received a third pom-pom station, which replaced a 4” mount behind the mainmast. Although the work on pom-pom design began as early as 1921, the guns were not installed on the Royal Navy vessels until 1930. At the time of their service entry pom-poms were considered very advanced weapons: their multiple mount arrangement and 14-round linked ammunition stowed in 140 round magazines provided very good rate of fire. However, the weapon had its weaknesses, too. The gun’s internal mechanisms were very complex and required a lot of specialized care and attention. Stoppages and jams were not infrequent. The weapon’s greatest drawback, however, was its very low muzzle velocity (due to a short barrel design) and completely ineffective ammunition. By the 1940s rapid improvements in aircraft design rendered the guns obsolete. Repulse’s AA armament was supplemented by Vickers 0,50’’/62 (12.7 mm) Mk III machine guns on quad Mk II mounts. The first two sets were installed in 1936 and placed on two small platforms each side of the stack, above the pom-poms. Two more stations were added in 1939 (mounted on platforms in the lower part of the mainmast). Although the Vickers guns were manufactured in large numbers and used on virtually all RN warships during World War II, they proved utterly ineffective against ever faster and more resilient aircraft. During her last modernization in 1941 the ship received eight 20 mm/70 Mk II AA guns manufactured by Oerlikon (4 on each side of the conning tower, 2 on each side of the aft superstructure and 2 on the roof of turret Y). The weapon was a very successful design and was perhaps the most widely used AA gun of World War II. The Oerlikons were very effective at close range against virtually all aircraft types. The full combat potential of the guns was limited on Repulse due to a small number of installed weapons. From the service entry until the 1939 modernization the ship carried four Hotchkiss 3-pdr (47 mm) QF Mk I saluting guns on Mk I mounts. In 1916 Repulse was equipped with two fixed 21” Mk II*** torpedo tubes (533 mm, 234 kg TNT bursting charge, range of 4 110 m at 45 kt) installed forward of turret A, below the waterline. The ship could carry a supply of ten torpedoes. In 1922 the torpedo launchers were removed and replaced with eight fixed above water tubes (installed in twin sets on each side of the hull, abaft of the stack and the mainmast). Installation of that sort of weapons on a large capital ship did not make much sense, especially when the torpedoes were to be launched from fixed tubes, which further degraded their effectiveness. Nonetheless, the torpedo tubes on Repulse were retained until the ship’s sinking in 1941. 9 foot (2.74 m) – each side of the forward superstructure, below the 12 foot rangefinder stations. During the last modernization in August 1941 the ship received the newest model of main gun fire control radar – Type 284. The set utilized 50 cm wavelength (600 MHz) and featured 25 kW power output, which allowed the “blind” tracking of a target. The radar sets of that type were successfully used for main gun fire control on cruisers and capital vessels until the introduction of centimeter wavelength units later during the war. Two radar Type 284 antennas were installed in a rotating dome on the conning tower and placed in a position that would not interfere with the rangefinders. In November 1941, while the ship was in transit to the Far East, she was probably fitted with Type 286P air surveillance radar (1.4 m wavelength, 6 kW power output). Initially the battlecruiser was equipped with as many as 10 searchlights (one on each side of the superstructure, two on platforms on the fore stack, four on platforms on the aft stack and one on each side of the mainmast). After the 1917 refit only eight searchlight remained and by 1936 the number was reduced to six 36” units (superstructure, aft stack and the mainmast). Additionally two 24” signal lights were installed on superstructure platforms. The Admiralty had a keen interest in exploring the possibilities of cooperation between the air and naval components, which gave rise to the idea of embarking aircraft aboard capital ships. In 1917 Repulse became the first Royal Navy heavy warship to carry embarked aircraft. First trials were performed using a single-seat Sopwith Pup aircraft launched from a catapult installed on the roof of turret B (the launch would be in the direction of the gun barrels). Later trials used a catapult mounted on top of turret Y (launching in the direction of the turret’s rear wall). Make-shift canvas hangars were erected on the ship’s deck. All experimental aircraft facilities were removed by 1933 and in 1936 Repulse received permanent aircraft handling equipment. Two seaplane hangars were installed abaft the aft smoke stack, complete with 7 ton cranes. A D(II)H type catapult was installed across the deck. The facilities could handle up to 4 seaplanes, although in practice that number would be most likely reduced to two. Initially the ship was equipped with Blackburn Sharks, replaced in 1939 by Fairey Swordfish seaplanes. Towards the end of her career Repulse carried Supermarine Walrus flying boats. In May 1940 a degaussing cable was installed on the ship as a countermeasure against magnetic naval mines. The cable ran along the external section of the hull. 30.12.1914 Order placed for the ship’s construction. 01.1915 Transportation of material earmarked for the unfinished battleship project from Palmers shipyard at Jarrow to John Brown & Company Shipyard & Engine Works in Clydebank, Scotland (the former could not handle the construction due to the ship’s size). 12.04.1915 Ship’s technical documentation is finished. 18.08.1916 Live weapons trials of all caliber guns. 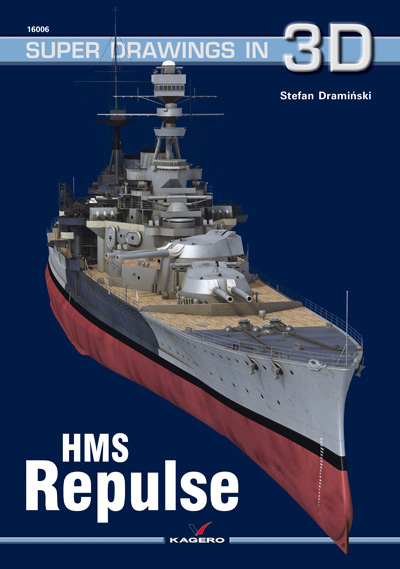 Repulse officially enters service with the Royal Navy in a record-breaking time (a little over a year and a half after construction had begun). 08-09.1916 Sea trials and crew work-ups. 21.09.1916 Joined the Grand Fleet as flagship of 1st Battlecruiser Squadron. 10-12.1916 Modernization at Rosyth (forward stack’s height increased by several meters, armor strakes’ thickness increased to 4”, additional 2” plating added to the main deck above the engine room, 2” armor plating added to the upper deck above the ammunition magazines, upper armor forward of turret A and aft of turret Y increased to 2.5”). 09.1917 Searchlight platforms rebuilt, launch platforms installed on turrets B and Y. 01.10.1917 Successful launch of a Sopwith Pup from a launch platform on turret B. 08.10.1917 Successful launch of a Sopwith Pup from a launch platform on turret Y. 16.11.1917 Deployed with 1 BCS in support of operation by light cruisers to intercept German minesweeping off Heligoland. 17.11.1917 The second battle of Heligoland: having fired 54 15” shells the Repulse crew score two hits against an enemy ships. Light cruiser Frankfurt suffers damage, while another light cruiser – Königsberg – sustains heavy damage. The battle’s result is inconclusive. 12.1917 Return to Grand Fleet base at Scapa Flow. 05.03.1918 Unsuccessful attempt to launch a two-seat aircraft from a platform on turret B. 21.11.1918 Present at formal surrender of German Hochseeflotte at Scapa Flow.